Almost every day at work I hear new names for new businesses. And sad to say, many of them would not be allowed by the UKIPO as they are too descriptive, or already registered as trade marks. The important point for me, is that a name is allowed and distinctive, rather than descriptive. But I love it when I see a name that manages to capture the essence of the product in a fun way. A great example is Gumdrop, a recycling point for chewing gum. I noticed the catchy sign outside work and snapped the photo below. 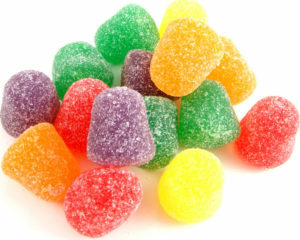 I love the bright colours and the reminder of the chewy sweet Gumdrops from my childhood. It is also a reminder that you can have the same name as someone else as long as you are not competing in the same sector. Even better, they are recycling chewing gum into useful plastic products, making themselves a social enterprise. This entry was posted in Advertising, going green, marketing, Trademarks and tagged recycling on 23 September 2016 by ninfield. Great idea and I love the shocking pink colour. Bazooka gum was that colour! Ah yes! I had forgotten that fact. A bit worrying to realise that chewing gum is made out of plastic. Doesn’t sound very whole-foody.